Among the troubles facing a “plein air” sketcher of people is that they move. This happened when I started the sketch below. I started drawing a young man with a blue mohawk. He was still during my first 30 seconds of sketching but moved on and another clerk took his place. I changed my focus to her and sketched her in the same space as blue mohawk man. I become confused when I draw one figure on top of another. I look at the subject and compare it to the lines I draw. Lines already there confuse the feedback between my eye and the line I draw on the paper. I like the portrait below. The viewer can identify two figures but the composite figure is also pleasing. 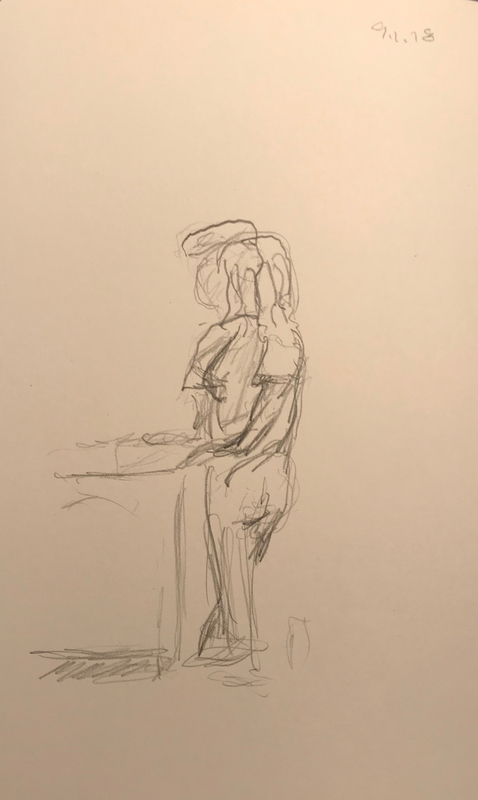 The practice of drawing two figures in one space could help the artist rely less on visual feedback and help strengthen drawing skills. This entry was posted in Personal Stories and tagged art, artistic process, artistic technique, drawing, overlapping figures, pencil sketch, plein air, practice, sketch, visual art. Bookmark the permalink.